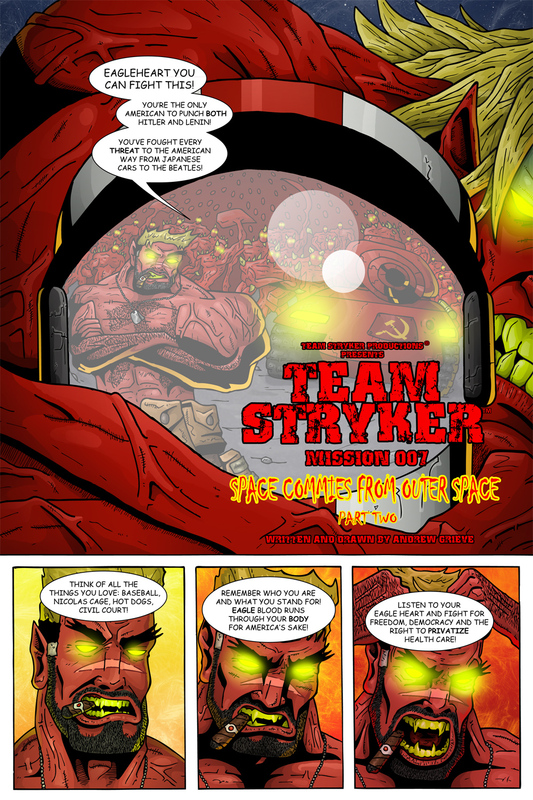 Welcome to the first page of Mission 007! This page was actually a modified idea I had for the cover of Mission 007 before I decided on doing the dual covers. I still really loved the idea of having characters in in the reflection of Dallas McKnight’s helmet and it seemed like a fitting start to the issue. There were a lot of steps to make sure Eagleheart and the Space Commies looked like they had the right curve to them while still being recognizable. I drew it normally in my rough layouts and then modified it before doing the final pencils. I looked at a lot of pictures taken with fish-eye lenses to try and get that curved effect. Let me know what you think of the start of Mission 007 on Facebook and Twitter and I’ll see you all back here on Wednesday!